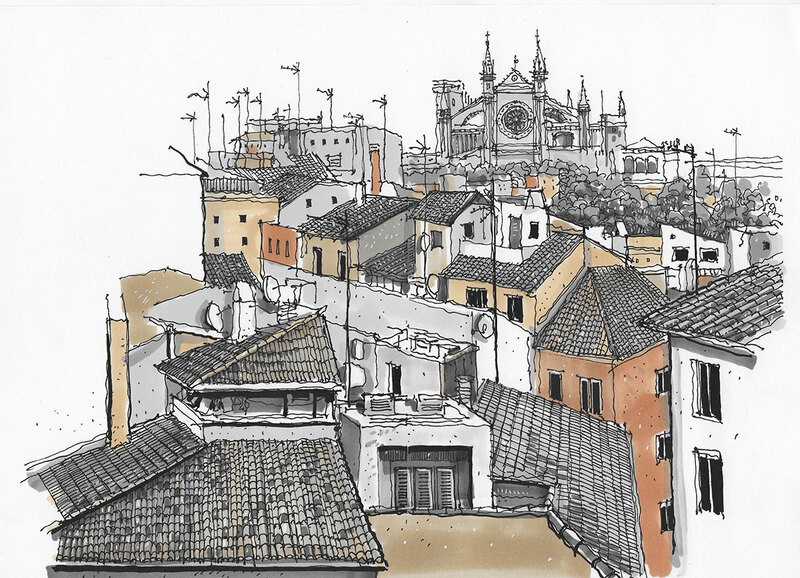 Phil Dean is an urban sketcher who likes to use markers to capture the architecture of a city when he travels. He is well-known in London as the Shoreditch Sketcher, referring to the East London area where he lives and works. 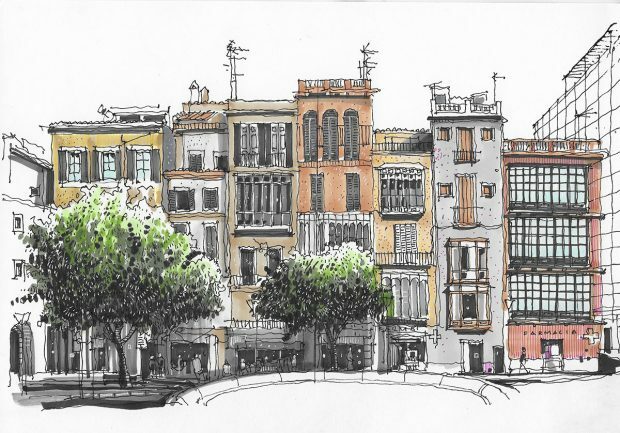 His Instagram profile is very popular with many fans of his skilful drawings using line and wash. Phil has a degree in Graphic Design from Leeds College of Art and leads urban sketching workshops in London. 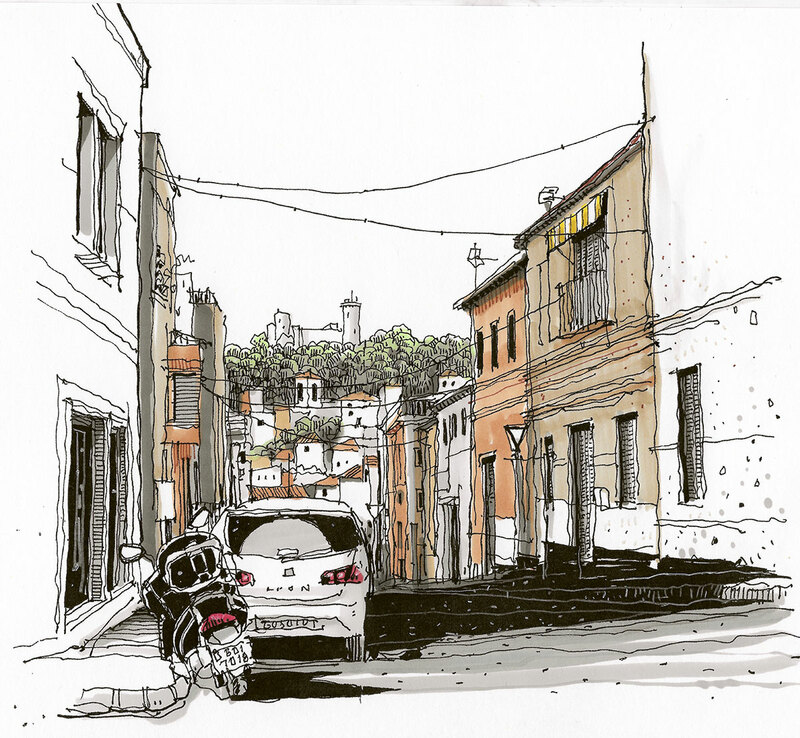 Phil is running a Sketching Workshop in September in his local neighbourhood of Shoreditch. I trained as a graphic designer in the eighties and markers were my go-to media to bring all my ideas to life. This was in the era before computers overtook the design industry, when graphic design skills were still traditional and very hands on. As a consequence, I got pretty good at using marker techniques to bring images to life. These days, I use marker for my sketch and illustration work and I think the time is right for a re-appraisal of markers and how they can be used in all kinds of art. The marker products available to the artist today are way more advanced than the ones I used and the choice is excellent. I’d like to share some of my top tips to help you get the best out of markers. 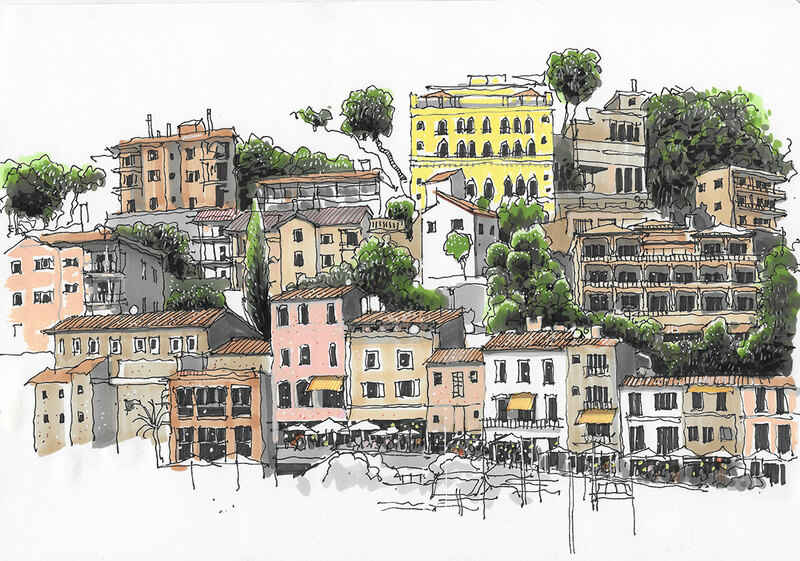 I’ve used my recent trip to Palma, Mallorca to show the potential of markers. 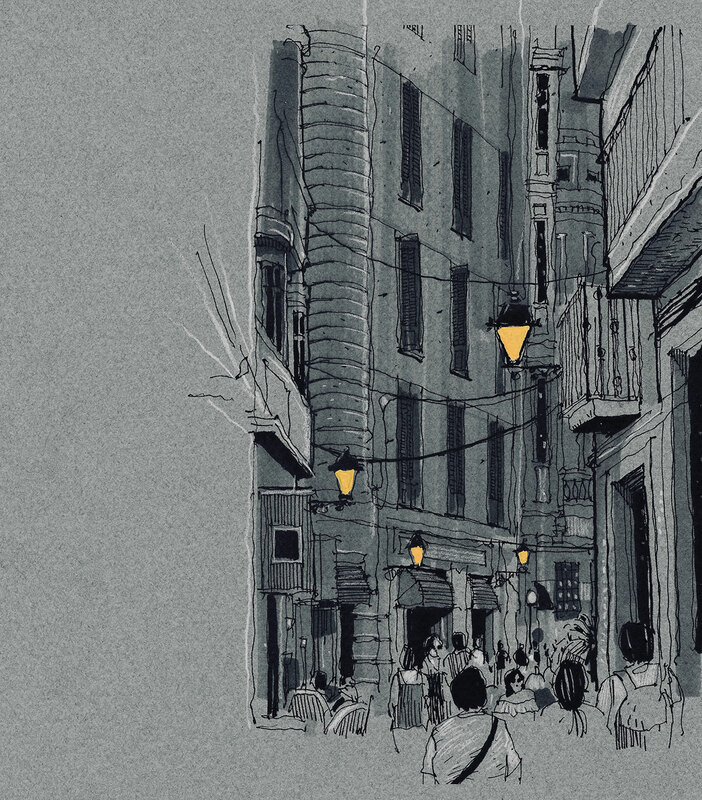 Marker are a really easy and accessible way of adding tone and colour to your line drawings. They’re not quite as intimidating as traditional media such as watercolour or gouache (and nowhere near as faffy) and not only do they allow the beginner lots of scope to experiment with adding tonality, they allow the more experienced artist to create serious depth of tone often associated with paint. If you already draw with a fineliner and use watercolour, then I think you’ll enjoy the immediacy of using marker and the similar techniques that can be achieved. If you draw clean lines, then I think you’ll be amazed by the depth marker adds to your drawings. Plus it’s fun to add it. Here’s an example of a line sketch I did along with the added marker. I love the line version and I love the tonal version too for different reasons: depth, atmosphere and a sense of place. What type of marker to use? I have historically used the Japanese Copic markers for my monochrome tinted artworks and I enjoy the subtlety, great blending and flat colour. Ink refills can be bought too allowing the pens to be endlessly topped up, and new nibs can be fitted. More recently I have been using the Winsor & Newton Promarker and Brushmarker and have been enjoying the range of colours and nib widths. The Brushmarkers in particular are great for adding colour to a drawing in a similar way to watercolour or gouache and are perfect for someone transitioning from an actual brush to marker. There are also watercolour markers by Winsor & Newton which are on my list to try and sound like the ideal cross over product…watch this space! There are of course, lots of markers on the market and it’s hard to know where to start. I would recommend getting a neutral Brushmarker cool grey or warm grey set by Winsor & Newton initially to experiment with the tints that way. The neutral sets contain more subtle shades and are perfect for someone trying marker for the first time. I always sketch when I’m out and about, using a Moleskine sketchbook and an assortment of fineliner pens — Winsor & Newton and Edding primarily. A good tip is to add the marker tone after the initial sketch as often the linework sketch takes up the time and marker can be added easily after the event. Take a quick snap on your phone to remind you of the light and then you have the beginnings of a great finished drawing. If you are keen to use marker in situ (which I am not as it’s tricky to pull off), then take out a basics set to get the light right, see my point above about neutral tones. If you have time, then this would produce a great result. But what about the paper? It’s worth bearing in mind that the best markers do ‘bleed’ through the paper due to their alcohol content and so the paper is a major consideration (water-based markers don’t but they’re not very good) . There are bleed proof marker pads on the market but I wouldn’t recommend these as they’re not really robust enough for sketching outdoors. If you are noodling in studio or at a desk, then bleed proof pads are a good place to start and Winsor & Newton have some nice ones. 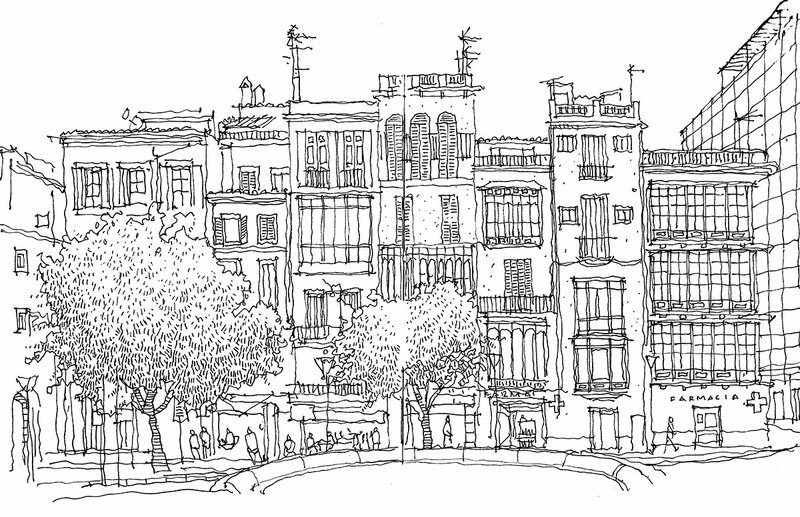 But if you are out and about in the ‘plein air’, then get a solid, small book to get the sketch vibe going – and one that takes the marker well. Given most sketch pads bleed, I like the surface of the Moleskine sketchbook for its opacity, smoothness and off white colour. The paper is sturdy and although you have to skip a spread as the marker bleeds through, the cumulative effect of sketching and markers is compelling. 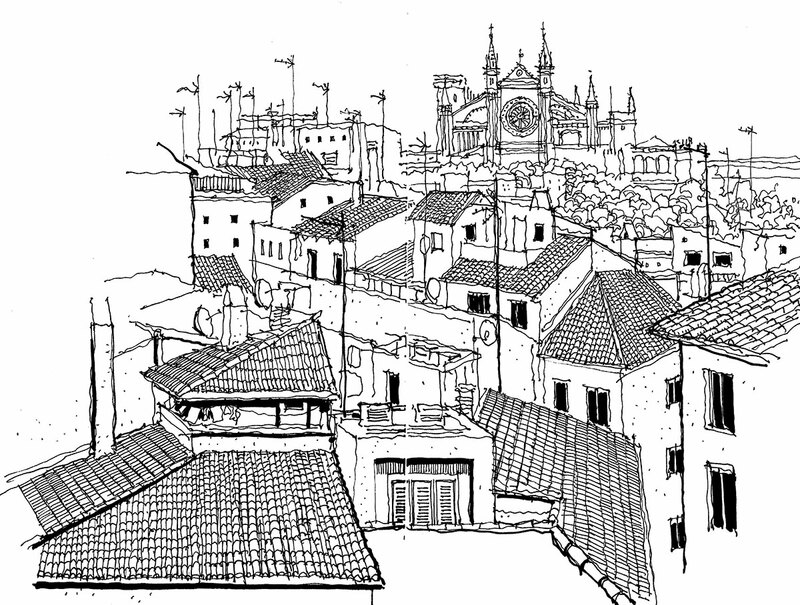 As a sketcher who draw in pure line primarily at the outset, one technique I would recommend is getting as far as you can with the line drawing and then scanning the image when back in your studio (sounds grand, but wherever your computer is). You now have a clean version of your sketch or drawing and then I suggest printing out on a nice stock (Canson or similar) and then adding marker, gouache, pencil etc. This is good to get your confidence with marker but you do need a photographic image to help sometimes with the tones. This is an ‘after the live sketch’ hack but well worth doing as it helps you get to grips with markers without ruining your original. I’m a massive advocate of monochrome marker work on coloured or natural stock (see below) as it will deliver satisfaction every time. There’s something about black and white. The danger with marker is if you try to create a realistic, colour scene then it does take some time to pull this off and basic technique won’t get you there. I would always start in black and white and go from there. Try popping is some highlights of colour in the monochrome marker tone, it will add life and focus to your drawing and give you confidence to push on from there. Marker is great to mix and match different media with. Pencil is great and can add lovely subtle lines, gouache is fab for solid slabs of white or black to contrast with the softness of the tones, pens of all shapes and sizes can be added as can gel pens (opaque flat whites). The simplicity and speed of marker encourages the artist to play around and not be too precious about the final image. It’s the perfect experimental medium where at the end of every drawing, something unexpected but satisfactory happens. 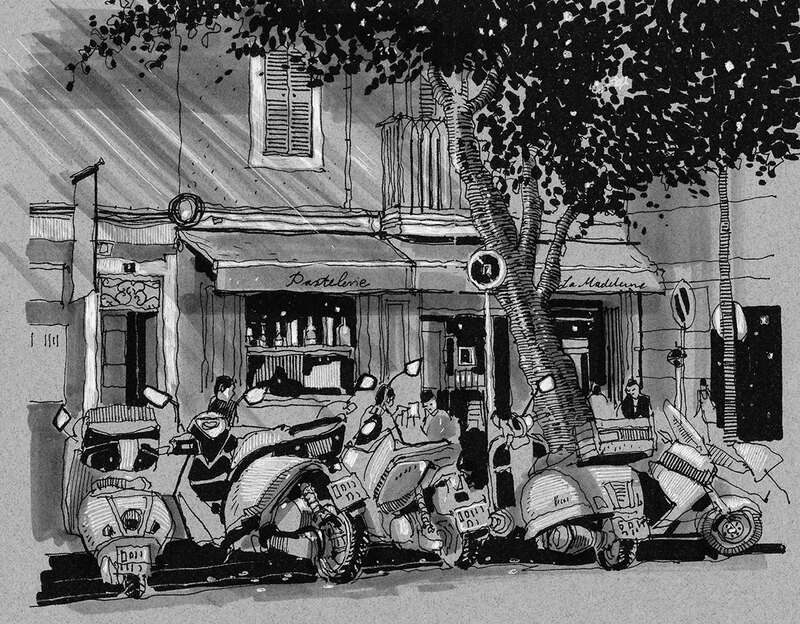 See more of Phil’s artwork on the Shoreditch Sketcher website. How can you buy Phil Dean pieces of work?